November 4 is coming quickly. . . although some in battleground states may not agree. Tonight is the second Presidential debate between McCain and Obama. Do you recall the first one they had? Hmmmm. . . . probably not, right? It was not too interesting and certainly did not live up to the hype of the Vice Predential debate between Palin and Biden. Perhaps that means you were going to skip watching the debate tonight. I say that you should watch the two candidates that will indeed give our country some sort of change in January. While watching why not play some Debate Bingo that TechyDad and I made up. 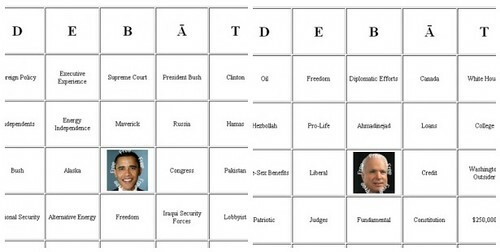 As Techy Dad puts it, "It is Palin Bingo on steroids!" Seriously head on over to Techy Dad’s blog to say hello and get your randomly generated Debate Bingo Cards. Speaking of fun things to do. Tomorrow night Mommytalk is hosting a LIVE Tupperware chat party. Susan, aka The Lil’ Mommy That Could has been quite busy working on this big event. Please do her a favor and visit Wednesday night. Here are all of the details about the Tupperware party. Happy bingo playing and Tupperware party going! Ok, the idea of debate bingo is just funny! Okay, my son saw the whole debate bingo thing in the Cleveland PD and decided that’s what we’re doing tonight…he showed me the article and I said WAIT! I have a better place for the bingo cards! So I just downloaded them and we’re all set! lol. How funny. We’ve turned this into an inexpensive family fun night! Thanks for the laughs! BINGO!